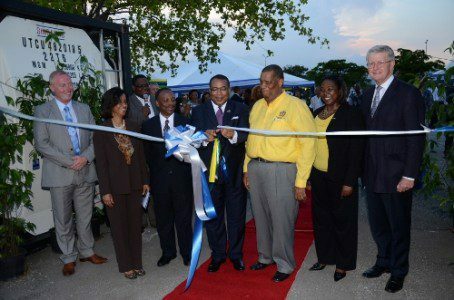 Jamaica’s Minister of Industry, Investment and Commerce Anthony Hylton has opened the island’s first tank cleaning depot capable of meeting food grade standards. The facility in Port of Kingston has been established by Isocon-JLB International, operated by Scottish engineering firm Isocon and Jamaican-owned JLB International Shipping. Much of the facilitation for facility was handled by JAMPRO, the Jamaican Trade and Investment agency. In Scotland, Isocon has over 35 years of experience in the cleaning, repair and refurbishment of ISO tank containers, and is particularly renowned for its food grade capabilities being an approved service depot to all the major Scotch Whisky Distillers. This latter experience is expected to be important in the Jamaican venture where the country’s government hopes the ability to clean tanks locally will be a boon for the entire Caribbean rum export sector. Start-up capital expenditure was J$50 million (US$560,000), and the facility will employ initially up to seven skilled workers. From conceptualisation to operation the Isocon/JLB project has taken approximately 18 months. Successful job applicants will be given additional training at Isocon headquarters in Glasgow, Scotland.